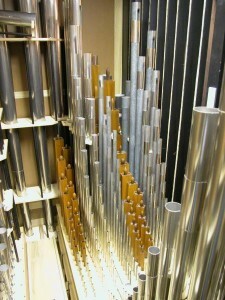 Some organ projects take a long time. In the case of this undertaking, it can perhaps be said that this project has taken 110 years! 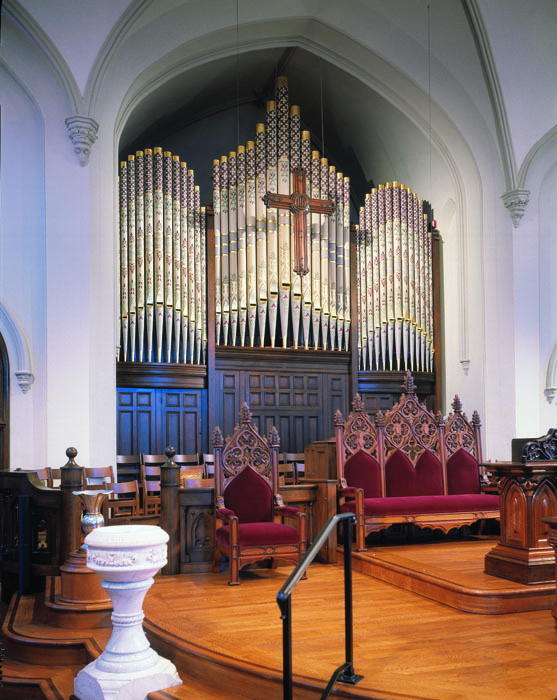 It was in 1897 that the W.W. Kimball Co. of Chicago, IL installed a two manual and pedal tubular pneumatic action pipe organ in First Presbyterian Church, Lexington, Kentucky. In 1936, Kimball revisited their now 40-year-old instrument, converting the action to electropneumatic action and making some minor tonal changes. Subsequent alterations and repairs, not up to the quality of the original work, led to the decision to pursue a comprehensive rebuilding. 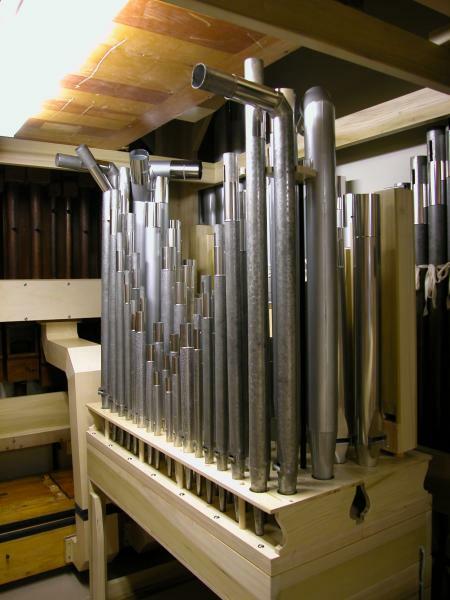 It was in May, 2004 that Buzard Pipe Organ Builders first inspected the organ, and met with the church’s organ committee. Our enthusiasm for the project and approach to the particular requirements of the project were a good fit with the church’s desires, and after jointly refining our vision a contract was signed on June 6, 2005 for a complete rebuilding of the church’s pipe organ. The organ was removed to the Buzard factory in February, 2006, with re-installation beginning just about a year later and taking about two months on site. Asterisk(*) denotes pipework retained from the existing organ and restored for the new tonal context. This project is not a restoration. Many changes had already been made to the instrument over its first 100 years, and although the organ made some nice sounds, it could not provide the full tonal palette that is desired for what this instrument is called upon to do. In addition, the mechanical systems of the organ were neither in good condition nor adaptable to the tonal changes being made. New electric pull-down slider and pallet windchests have been constructed for the straight manual stops, and new electropneumatic action windchests have been constructed for the unit stops. A new building frame and structure has been constructed behind the original casework, with new enclosures incorporating the Kimball shutter frames. 25 stops of Kimball pipework have been retained, supplemented with 11 ranks of new pipework. All of the existing pipes have been carefully repaired and re-voiced, and all the new pipes were custom scaled and built for this project under the watchful eyes (and ears) of the Buzard Company’s Tonal Director, Brian K. Davis, with all tonal finishing completed on site by Mr. Davis and Mr. Buzard. The visible façade pipes, containing basses of the 16′ and 8′ Diapasons, have been brilliantly decorated using the original patterning. The organ is now in as-new condition, ready to sound forth in its second century with both bold new voices and sounds that echo from its past. Everything old is new again! 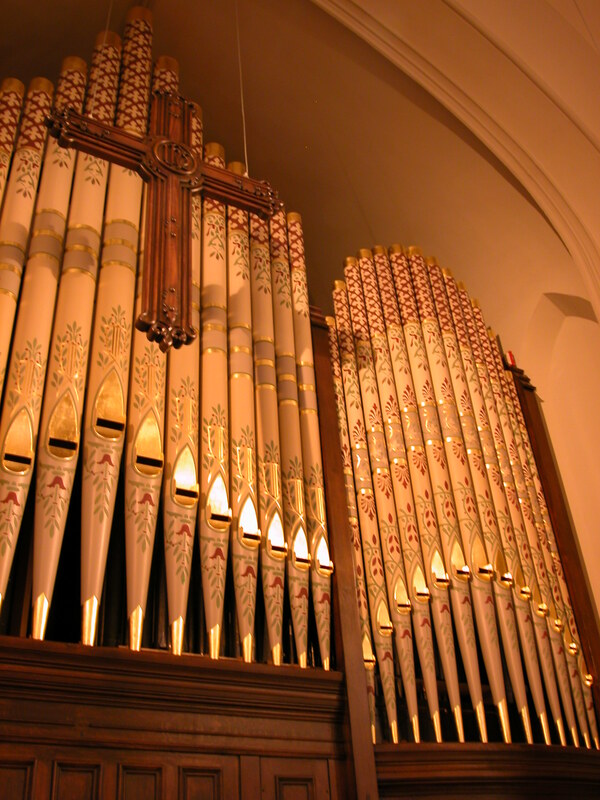 In March, 2004 I was invited by the Director of Music and Arts, Marlon Hurst, to advise the organ committee of the First Presbyterian Church as to what might be the best avenue to pursue with regard to their organ. On visiting the church I found a rather decrepit instrument, originally built in 1897 by the noted Kimball firm, which had subsequently been repaired, patched, altered and added to on several occasions by various people. Kimball had electrified the action (originally tubular) and replaced the console in 1936, but both action and console were now rapidly deteriorating, resulting in dead notes, loose pedal keys and an erratic combination action. Examination of the interior revealed obsolete windchests, a patchwork electrical system with components ranging from the 1936 electrification to recent solid-state, a replacement (and slow) swell shade motor, inoperative top-note pedal extensions, leaky windlines patched with duct tape, recently recovered reservoirs and winkers, and evidence of some re-leathering of primaries. Even visually, the organ had been changed, the casework darkened, and the display pipes (along with much of the rest of the church interior) painted a dull off-white to match the sanctuary’s then rather drab interior. Tonally, there had been a few substitutions, along with various additions and extensions on offset chests, most of them done at different times and by different people. 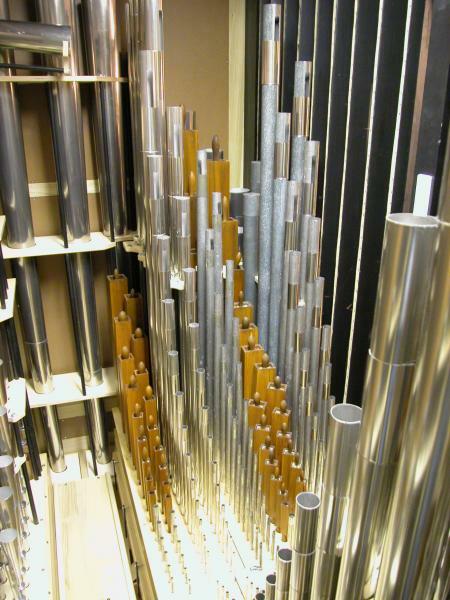 The original Kimball pipework was, however, reasonably intact and in good condition, although generally in poor tonal regulation and tune, some stops showing evidence of less than successful re-voicing attempts. 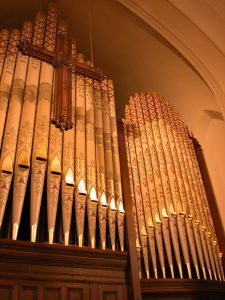 Yet despite the gradual disintegration of the organ’s original integrity, this pipework, with all its defects, still gave a strong and admirable impression of the original rich Kimball sound. The committee had been wrestling with various approaches, from possible restoration to more patchwork repairs and additions to total replacement. After discussion with this very motivated committee, a more attractive option emerged. Because of all the changes and additions, restoration as an authentic Kimball was really out of the question. More patchwork could be dismissed on the basis of the dubious results it had achieved in the past. An entirely new organ was an option, but the most costly one. And then there was the matter of all of that excellent Kimball pipework with its distinctive character which all of us agreed that we liked. Since the faults of the organ as it stood were primarily mechanical, we eventually agreed to focus on a new option, that of retaining and respectfully treating the Kimball pipework, possibly with a few carefully integrated new stops, but replacing all of the mechanical components with new, excepting perhaps the console shell and a few reservoirs. 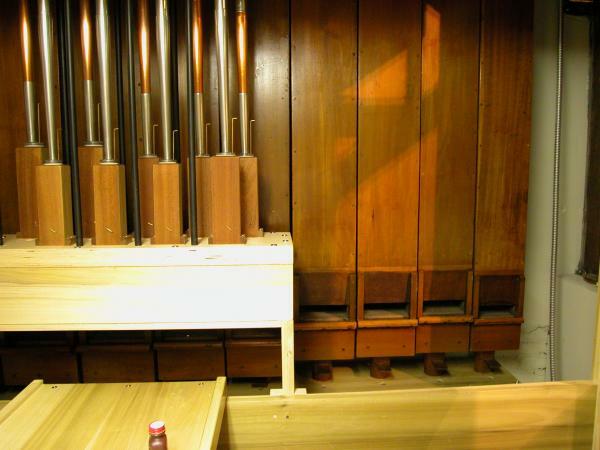 The hoped-for result would be a reliable and essentially new organ with a “vintage” sound. The committee’s eventual choice of the Buzard firm was based not only on their favorable impressions of the quality of the firm’s work, but also on the builder’s willingness to make the most of the Kimball pipework in a tonal design that also included some additions to expand the overall usefulness of the organ in the church’s very active and vital music program. Because the organ project was to be integrated into a larger plan of renovating and redecorating the church interior under the direction of Terry Byrd Eason, making more space for the choir was strongly recommended by all involved and was included in this plan. Once a builder had been chosen, he and the architect worked together on renovating the organ chamber and certain other details. Eventually it was discovered that Kimball’s display pipes had originally been colorfully stenciled, and, with the enthusiastic agreement of all involved, restoration of this element was added to the project and executed by Kristin Farmer, one of the most highly respected practitioners of this rather arcane art-form. Along with the restoration of the pulpit furniture to its original finish and a warmer and more historically authentic color scheme, the stenciled pipes have added considerably to the visual interest of the room. Throughout the three years of the organ project, the committee and I were in regular communication as questions arose and some minor changes were considered. Indeed, I will have to say that Marlon Hurst and his committee comprised one of the most conscientiously dedicated groups that I have ever worked with. That their dedication paid off abundantly was demonstrated on Sunday, April 29, 2007, when the organ and the beautifully refurbished sanctuary — complete with improved acoustics — were dedicated in a unique Festival of Psalms, Hymns and Spiritual Songs that included hymn-singing, choral music and organ music (both solo and with brass) impressively performed by John D. Schwandt. In one nicely-orchestrated and well-attended event, the organ was put through its paces in all of its varied functions, and came through with flying colors. Its Kimball antecedents were clearly present in the warm foundations, lush strings and colorful solo stops, now all well-regulated again. Buzard’s new mixtures dovetailed seamlessly into the well-balanced choruses and the powerful new Tromba rank proved a successful “climax” stop. Musicians, clergy, architect, consultants and builders alike came away happy with what had been accomplished. But of greatest importance will be the far-reaching effects of a more welcoming sanctuary and a well-crafted and versatile organ for the church’s future worship and outreach. 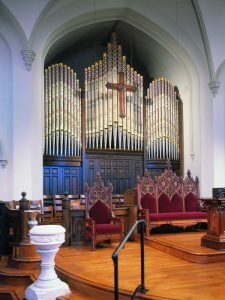 The W. W. Kimball pipe organ at First Presbyterian Church was built in 1897. In 1936, Kimball installed electropneumatic action and replaced the console. By 2004, the instrument, apart from re-leathering and some minor tonal work undertaken in the period between the 1970s and 1990s, was showing the signs of wear that would be expected from the nearly 70 year-old electrical and mechanical components. It was deemed by the church’s Property Ministry Team that a major decision about the future of the instrument needed to be made – the question was the direction to take. The consideration of a major renovation – or replacement – of the pipe organ proved to be the impetus for examining other areas of concern in the 1874 sanctuary – issues of acoustics, chancel design, lighting, structural integrity and aging HVAC systems. Much like the maintenance history of the organ, each of these areas had received varying degrees of attention and improvement during the past century, but none of the improvements had been made in the context of a comprehensive plan. With the identification of such a potentially comprehensive restoration project to the organ and sanctuary, a Long Range Planning Team (LRPT) was formed with the charge to thoroughly investigate the needs of the sanctuary and organ in the context of the overall ministry of the congregation. The LRPT enlisted the services of two consultants who would prove to be crucial to the direction of the project: Terry Byrd Eason, liturgical design consultant, and Barbara Owen, organ consultant. At Ms. Owen’s recommendation, proposals and bids for the rebuilding project were solicited and received from five regional organ builders. In turn, trips were made to Atlanta, Cincinnati and Indianapolis to listen to representative work of each builder who submitted a proposal. The proposals fell into two major categories: two of them proposed to build an instrument with a tonal scheme that was more in line with their own tonal philosophy, utilizing the Kimball pipes that could fit into that scheme. The remaining three proposed to use the Kimball timbre as the tonal foundation while incorporating their own pipe work to broaden the palate and bring cohesiveness to the overall instrument. Under the continued (and always impartial) guidance of Barbara Owen, we narrowed the field to two builders. A larger organ committee was formed to visit representative rebuilding work of our two final candidates. After hearing the tonal work of John-Paul Buzard, the committee unanimously agreed that it was Mr. Buzard’s work and proposal that best matched the goals stated by the LRPT. 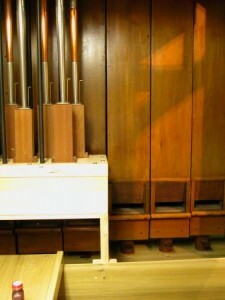 At some point in the mid 20th century, the organ façade pipes (a functioning 16′ Open Diapason) had been painted over to match the color of the sanctuary walls. There was some photographic evidence from the early 20th century that the façade had originally been stenciled, though the details of the pattern were not discernible from the quality of the extant photographs. Whatever decision that was to be made regarding the appearance of the façade pipes, no one desired to paint them the color of the walls! As the paint was being stripped from the pipes, the “shadow” of the original ornate stenciling pattern was discovered – and it was found intact to such a degree that made possible its restoration. While this discovery was an exciting one, there was some concern that the visual prominence of such highly decorated pipes — including the use of gold leaf — would be an excessive point of focus and attention in a sanctuary that was devoted to the worship of God and not to the worship of music! When stencil artist Kristen Farmer learned that “the church was allergic to shiny,” she assured us that her use of gold leaf was hypo-allergenic. Careful consideration was given to the color choices so that they would be consonant with the overall color scheme in the sanctuary. It was further decided that a large wooden cross, designed by Terry Byrd Eason, would be commissioned to hang in front of the façade pipes, thereby visually reinforcing the fact that Christian worship is the primary activity that takes place in the space. After all of the planning and careful consideration that led to the selection of a builder had been completed, we could only rest in the faith that we had been thorough in our process and that we had made the right choice in John-Paul Buzard. When John-Paul completed his work on the organ in April, 2007, it was confirmed that we had chosen well. His respect for the pre-existing voicing found in the Kimball pipes guided his approach to the voicing of the entire instrument. Now, the old pipework blends with the new in a seamless way that is at once identifiably Kimball, while being skillfully broadened beyond the constraints of late 19th century American tonal philosophies. The end result of the project is that we have preserved the best of what we had inherited from our predecessors and have provided for those who worship in this place now and in the years to come an instrument that is capable of accompanying a wide variety of choral and congregational song, and on which can be faithfully played the broad spectrum of historic and modern organ repertoire. Soli Deo Gloria. The organ and sanctuary renovations were dedicated on April 29 in a service of “Psalms, Hymns and Spiritual Songs” – a service of worship featuring organ repertoire, along with choral and congregational song. The service was led from the organ by Dr. John D. Schwandt, and featured a new choral anthem by Dr. John Ferguson, commissioned for the occasion by the Chancel Choir.